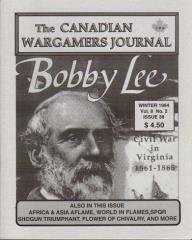 #38 "Bobby Lee, Clontarf Scenario, SPQR"
Review, strategy and tactics, official errata and question & answers for Bobby Lee, Columbia's ACW block game. Rebuttal of the Napoleon review. World in Flames Fuel Point variant.